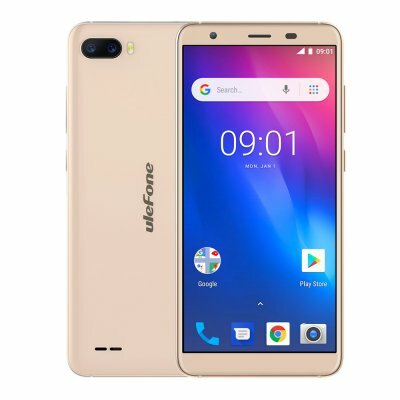 Successfully Added Ulefone S1 3G Smartphone - 5.5 Inch, MTK6580 Quad-Core 1GB RAM 8GB ROM, Android 8.1 - Gold to your Shopping Cart. Support file playing function, can be classified as pop songs, classical songs, songs like his wife, etc, to create different folders in the memory card inside were easy to play. Support high-capacity SD card / MM card, U disk and other memory playback. Electronic tuning radio function, automatic income units, storage units support the power and memory. Vehicle regulations LED display technology, ultra-bright display, but the glossy soft, not dazzling. Android 8.1(Go Edition) is specially customized for the entry-level smartphone. It contains the best Android delivers a powerful experience to Ulefone S1. Thanks to the Go edition less memory and storage consumption, S1 will be faster than a regular Android phone. Even with 1GB of RAM, everything blazing fast, smooth and easy to use, elevating your Android experience to a whole new level. Just with one move to unlock your phone, say goodbye to the annoying of remembering the different and complex passwords or patterns. Don't need to design complicated password to keep safe due to each of you have the unique face in this world. Never shall be this way so simple, fast and effortless as well as safer than usual. Thanks to the powerful 18:9 All Screen display, Ulefone S1 manages to take you into a visual feast as well as fits your comfortable grip, which offers you a never before experience. And the new viewing experience has generated plenty of excitement and shocking in the technology. Ulefone S1 comes packed with the powerful MediaTek MT6580 quad-core processor, 1GB of RAM, whereas the 8GB internal storage to enhance the processing power for helping the phone execute your request speedily. Say bye-bye to hiccup and let's start the new phone adventure. With high-resolution 8MP/5MP dual rear cameras, SLK, Beauty, Watermark--all these functions serve you to catch up the unforgettable moments at your fingertips, resulting in precious memorise for you. The phone also comes packed 5MP self-snapper for allowing you to preserve your own smile or precious memory in outstanding clarity. Carried a powreful 3000mAh batttery along with smart energy-saving management, Ulefone S1 offers you the feeling of security no matter calling, listening or playing a whole day with one single charge. It's rated to offer up to 23 hours of music playback time, up to 250 hours of standby time, up to 6 hours of uninterrupted video palyback, and talk time of up to 11 hours. GPS navigation system will lead you directly to rightway. Will make you never lost even in strange territory. With two SIM numbers available in one phone, getting your life easier and more convenient. There is no need to remove the card manually to switch in working life or personal life anymore and never shall be a problem to enjoy the high-speed local network when traveling.